Electricity meters measure a property’s electricity consumption and are used by energy companies to calculate what to charge on your electricity bill. There are three key types of electricity meter and while you might be wondering “who cares?” the type of electricity meter you have can have a huge impact on your power costs. Read on for an explanation of each meter type. Accumulation meters, also known as single rate or flat meters, measure how much electricity has been consumed by the property. Accumulation meters can’t discern when the electricity has been used, so customers are charged the same rate for electricity regardless of the time of day that they use power. Some customers may also choose a block rate tariff depending on the distributor. These tariffs charge different rates depending on how much electricity you’ve used. There are three types of accumulation meter display (pictured above left to right) – Cyclometer display, dial display and digital display. The digital and cyclometer displays are easy to read – the display simply shows how much electricity has been used (kWh). Dial accumulation meters are slightly more confusing. They have five small dials with numbers 0 to 9. From left to right, read the numbers the dial hands fall on. If the hand falls between two numbers, then take the lowest number (unless it falls between 0 and 9, write down 9). 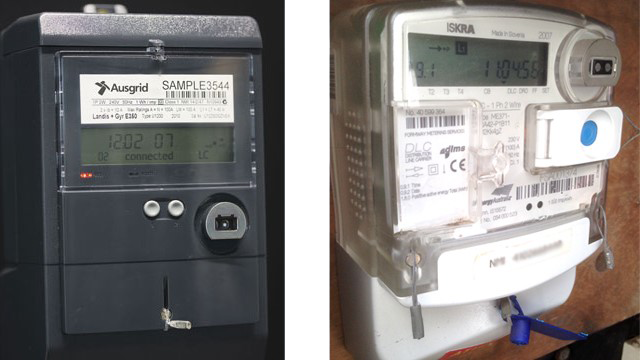 The meter dials in the illustration on the right show a consumption of 46,925 kWh. The red dial can be ignored. Accumulation meters require a meter reader to come to the property every three months to check how much electricity has been used. This is done by calculating the difference between your current and your previous meter reads. Some energy retailers choose to offer monthly billing, in which case your bills will be estimated between meter reads. Interval meters record electricity usage every 30 minutes. This means power retailers can charge you different rates depending on the time of the day you use electricity. In this case, you may be charged with a time of use tariff. Time of use tariffs can charge customers extremely low rates during off-peak times such as late at night. But the trade-off is that you’re charged very high rates during peak demand times around the early evening. Even if you have an interval meter, you can still opt to be charged on a flat rate or block rate if you’re not comfortable with paying different prices for different times of day. Interval meters are digital, so they’re pretty straightforward to read. If you want to estimate your next bill, then you’ll need to make a habit of jotting down the kWh figures displayed. Meter readers record interval meter data by attaching an optical probe which extracts the interval meter data and then sends it to the distributor’s systems. The distributor then processes the data up to ten times to ensure its accuracy before sending it to your retailer for billing. Smart meters, also commonly known as ‘digital meters’, are the latest in energy metering technology. Similar to interval meters, they record electricity usage in 30 minute intervals allowing different rates to be charged at different times of day. 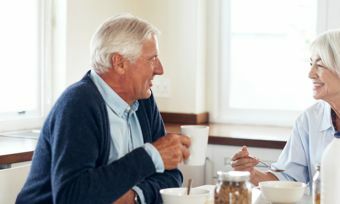 In some parts of Australia, your smart meter may even be referred to as an interval meter – the difference however is that smart meters can be remotely read. This means a meter reader doesn’t need to visit your property and you should never receive estimated bills. You can read a more in-depth guide to smart meters and their advantages here. Smart meters display your usage in kWh on a small digital screen. Smart can meters send live electricity usage information to your electricity distributor. Not only does this mean a meter reader isn’t required, you may be able to track your own electricity usage through an energy monitor or online portal. These provide unparalleled insights into your usage, helping customers identify where they can save electricity and reduce their bill. If you’ve installed a solar PV system or storage battery then you will need a two-way or bidirectional electricity meter that can measure both incoming electricity and solar electricity being exported to the grid in exchange for a feed-in tariff. 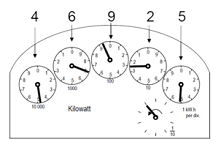 Most modern interval meters are also bidirectional, as are virtually all smart meters. If you have a dial or cyclometer accumulation electricity meter however, then you will require a meter upgrade in order to accurately measure you power exports. Which type of electricity meter is the best? Upgrading your meter will usually cost around $1,000 and the installation process might disrupt your power supply. If you’re not sure you can front the installation cost, many retailers offer smart meter upgrades that can be repaid incrementally through your electricity bills.